Aaron Brock scored a career-high 29 points Friday night to lead the Little Giants to an upset win over Wooster 87-63 in the semifinals of the 2008 North Coast Athletic Conference Men's Basketball Tournament. The Little Giants advance to the conference championship game for the second time in school history and the first since 2000. They play Ohio Wesleyan University at 7 p.m. in Wooster. Saturday night's game will mark the first time since 1988 the league's championship game will not feature either Wooster or Wittenberg. Brock was one of four Little Giants scoring in double figures. Wes Smith and Andrew Zimmer each had 12, while Chase Haltom finished with 11. The Little Giants won the game at both ends of the floor, holding the normally hot-shooting Scots to 37 percent from the field (21-of-54) and only four three-point baskets in the game. Brock, who led Wabash with 21 points in the Little Giants' win at Kenyon in the Tuesday's quarterfinal game, was nearly flawless in the game, hitting 8-of-11 shots, including three of his five three-point attempts. He added five rebounds, two blocked shots, and solid interior defense. The Little Giants trailed 4-3 before Brock began his scoring blitz by hitting the first of four three-pointers for the sophomore forward. 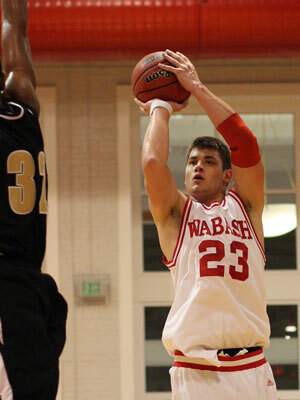 The shot started an 8-0 run for Wabash, putting the Little Giants out to a lead they would never relinquish. Wooster got a layup from Evan Will to cut the lead to five, but free throws from Gary Simkus and a layup by Zimmer boosted the advantage to nine points. The Scots cut the lead to five with 12:52 left in the first period when Devin Fulk nailed a trey --- one of the few of the evening for the Scots. Wabash responded with a 9-1 run to move in front by 13. The Little Giants lead increased to 16 late in the period, eventually falling to 10 points when Wooster freshman Ian Franks drilled a three from the top of the arc with 45 seconds left in the half. Wabash never panicked, working the clock down until Brock came through once again, hitting a huge three of his own in front of the Wooster bench with seconds left in the half for a 46-33 lead. Wooster cut the lead to four points in the opening minutes of the second half with an 11-2 run. James Cooper, the Scots' leading scorer coming into the game, canned a shot five minutes into the final period to make it a 48-44 contest. The Little Giants finally awakened when Smith hit a layup with 12:32 left in the game for the first basket of the half for the team. The shot sparked a 14-0 run for Wabash that quickly put the Little Giants up 20 points. Wooster got the lead down to 15, but Zimmer hit a jumper ahead of another Brock trey to begin a 12-2 run that put the game out of reach. Smith, Haltom, and Earl Rooks combined to hold Cooper to 14 points on 4-of-13 shooting. Cooper came into the game hitting 51 percent of his three-point attempts, but was 0-6 from beyond the arc in his final college game against the Wabash defense. Cooper was joined by Bryan Wickliffe and Fulk for top-scoring honors with 14 points. Franks added 12 for the 11th-ranked Scots (23-4). Wabash is the fifth seed, and not beaten Wooster since 2002. The Little Giants had never beaten the Scots in the NCAC Tournament, losing 92-80 at Wooster in last year's semifinal game. The Little Giants (18-9) split the season series with Ohio Wesleyan. Wabash won 67-62 at home before dropping an 86-57 decision at OWU. The Battling Bishops defeated Allegheny 79-63 in the earlier semifinal game. This will be the first time the two teams have played in the NCAC Tournament since a 62-52 quarterfinal win by Wabash in 2005.